Announcing… We’re developing a TV series at NBC! We are developing a television series at NBC… and we want you to go on the journey with us! It’s still a long road before we know whether we will get this series on television — but I’m so excited to invite you to go on this journey with us. In this political climate when hate against many communities, including the Sikh community, are the highest they have been since 9/11, I believe we need to tell stories that inspire wonder, empathy, and action — and entertain a broad audience. And so this series represents our attempt to help shift American culture through the arts. Here’s the story of how we got here. For years, my film partner and husband Sharat Raju and I have made documentaries and independent films lifting up the stories of our communities. The stereotype of the “Muslim terrorist” has dominated America’s imagination since 9/11 (and before). Every news cycle, television show, and film that portrays us as “them” continues to fuel unjust policies and acts of hate against our communities. But we saw how our own stories can change how people see us, from strangers to sisters and brothers. So we began to dream big: What if our stories could reach millions? Sharat had an idea for a television series featuring a band of law students in a renegade law clinic, fighting the good fight. We nurtured the concept for… EIGHT years. There were times it seemed impossible. We recruited one of our best friends and teammates Tafari Lumumba to scheme with us, and together we kept the show alive. Then we found our champion. The award-winning actress/activist America Ferrera saw the magic in the concept. This summer, she took on the project with her incredible producing partner Teri Weinberg and support from Drew Brown. 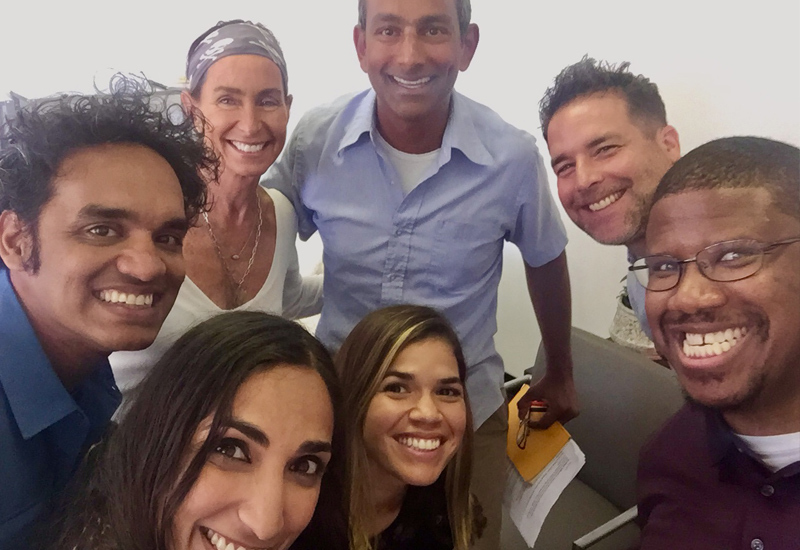 They recruited the brilliant television writer Sunil Nayar, and just like that, we had an unstoppable team. Sunil’s vision took the show to the next level. He believed the lead character should be Sikh, mining my stories, reflections, and experiences to create Amrita Kaur. We developed the show together for months, following Sunil’s lead. We pitched it to NBC — clapping, laughter, tears! They bought it in the room. I am so grateful to NBC for their leadership in the television industry. The pilot script is now being written and we hope to have the opportunity to shoot the pilot in the new year. We will find out in the spring whether NBC orders our show to broadcast. In a time such as this, every work of art is a political act — it can confirm the stereotypes that are killing us — or counter them. And so I see this series as our experiment in what #RevolutionaryLove looks like in entertainment. We would love for you to go on this journey with us! We are deciding on a name for Amrita’s mother. What would you name the first Sikh mother lead on television? We want to hear your suggestions. Please click here to add a comment with your idea and like other people’s suggestions on Facebook.